Working in food production or home improvement can become messy, particularly if you're handling items with your hands. 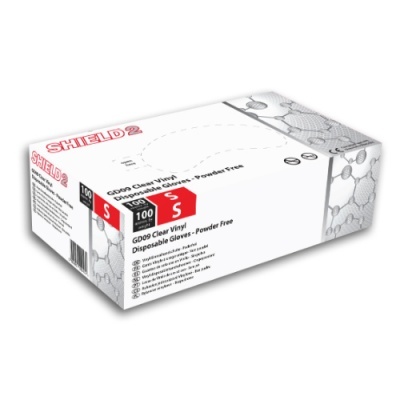 The Shield2 GD09 Powder-Free Vinyl Disposable Gloves (Pack of 100) are made from high-quality PVC plastisol to provide durable hand protection. As they're disposable, you don't have to go through the effort of cleaning the gloves after each use. The Powder-Free Vinyl Disposable Gloves have been evaluated in terms of their suitability for coming into contact with food. According to the test, these gloves are suitable to do so with the exception of fatty foods. The Shield2 GD09 Vinyl Gloves are available in four sizes and are ambidextrous in design. This means they're likely to suit the hands of most users. To find the correct size, please measure your hand across the widest part of your palm then refer to the sizing table beneath. Please note that all sizes of these gloves have a minimum length of 240mm.